Few laptops undergo an upgrade (or, in any case, it is difficult), but to increase the amount of RAM in many cases is quite easy. This step-by-step instruction on how to increase the memory of the laptop and is aimed primarily at beginners. Some laptops of the past may not have a well-balanced configuration by today’s standards, for example – Core i7 and 4 GB of RAM, although it can be increased to 8, 16 or even 32 gigabytes for some laptops, which for a number of applications, games, work with video and graphics can speed up the work and relatively inexpensive. It is worth noting that to work with a large amount of RAM, the laptop will need to install 64-bit Windows (assuming that now 32-bit is used), more: Windows does not see RAM. Before buying memory slots (RAM modules) to increase RAM on a laptop, it would be nice to know how many slots for RAM are in it and how many of them are occupied, and what type of memory is needed. If you have Windows 10 installed, you can do this very simply: launch the task manager (you can from the menu that appears by right-clicking on the Start button), if the task manager is presented in a compact form, click the “Details” button below, then go to the tab “Performance” and select “Memory”. 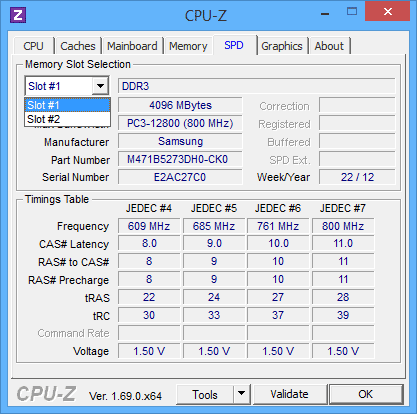 On the bottom right, you will see information on how many memory slots are used and how many are available, as well as data on the memory frequency in the “Speed” item (from this information you can find out whether DDR3 or DDR4 memory is used on the laptop, also the type of memory is indicated at the top of the spam ). Unfortunately, this data is not always accurate (sometimes there are 4 slots or memory slots, although in fact there are 2 of them). 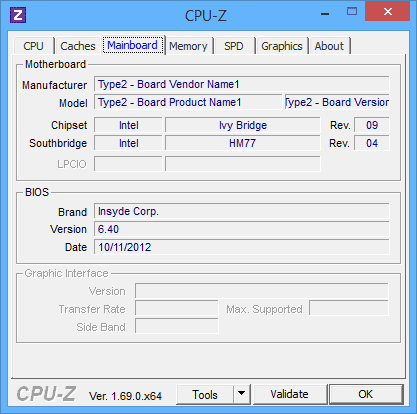 In Windows 7 and 8, there is no such information in the task manager, but here the free program CPU-Z, detailing information about the computer or laptop, will help us. You can download the program from the official developer site at https://www.cpuid.com/softwares/cpu-z.html (I recommend downloading the ZIP archive to run CPU-Z without installing it on the computer, located in the Download column on the left). On the SPD tab, you can see the number of memory slots, its type, volume and manufacturer. If all fields are empty when one of the slots is selected, it means that the slot is most likely empty (once faced with the fact that it was not so). On the Memory tab, you can see details about the type, total memory, timings. On the Mainboard tab, you can see detailed information about the laptop motherboard, which allows you to find the specifications of the given motherboard and chipset on the Internet and find out exactly what memory and in what amounts is supported. In general, in most cases, it’s enough to look at the SPD tab, all the necessary information on the type, frequency and number of slots is there and one can deduce from it whether it is possible to increase the memory of the laptop and what is needed for this. 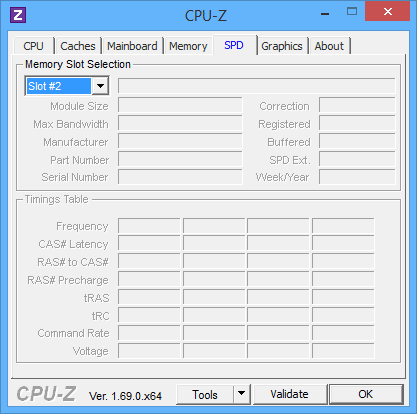 Note: in some cases, CPU-Z can show 4 memory slots for laptops, in which there are only 2 of them. Consider this, as well as the fact that almost all notebooks have 2 slots (except for some gaming and professional models). On the laptop two slots for RAM. One is occupied by a 4 GB DDR3 PC3-12800 module. The chipset used is HM77, the supported maximum memory is 16 GB (it is searched on the Internet by chipset, laptop or motherboard models). Buy another module 4 GB RAM SO-DIMM (memory for laptops) DDR3 PC12800 and increase the memory of the laptop up to 8 GB. Buy two modules, but for 8 GB (4 have to be removed) and increase the operating memory to 16 GB. For operation in two-channel mode (and this is preferable, since the memory operates faster, with a doubled frequency), two identical modules are required (the manufacturer can be different if, for example, we use the first option) in two slots. Also, keep in mind that the maximum amount of supported memory is given for all connectors: for example, a maximum of 16 GB of memory and two slots, which means that you can install 8 + 8 GB, but not more than 16 GB of memory. Look for information about the maximum amount of RAM specifically for your laptop on the Internet. Unfortunately, not always such data is on official websites, but often there are on the outside. 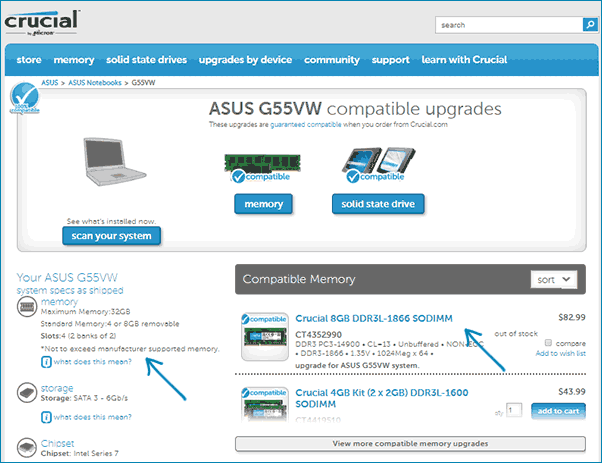 For example, if you enter the query “maxm model” in Google – usually one of the first results is a site from the manufacturer of Crucial memory, which always has exact data on the number of slots, the maximum volume and the type of memory that can be used (example information on screenshot below). 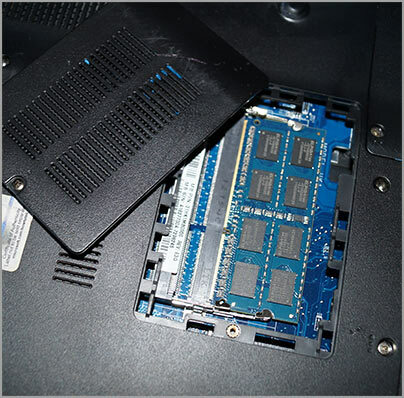 If it is not difficult for you to do this – visually see what memory is already installed in the laptop, whether there is an available connector (sometimes, especially on cheap laptops, there may not be a free slot at all, and the existing memory strap is soldered to the motherboard). In this example, we will consider the option of installing RAM in the laptop, when it was directly stipulated by the manufacturer – in this case, access to the memory slots is facilitated, as a rule, there is a separate cover for this. Previously, this was almost the standard for laptops, now, in pursuit of compactness or for other reasons, separate technological covers for replacing components (eliminating the need to remove the entire lower part) are found only on some devices of the corporate segment, workstations and other laptops that go beyond framework of the consumer segment. Those. in ultrabooks and compact laptops nothing like this: you need to unscrew and carefully remove the entire bottom panel, and the disassembly scheme may differ from model to model. Moreover, for some laptops such an upgrade means a loss of warranty, consider this. Note: if you do not know how to install memory in your laptop, I recommend you to go to YouTube and search for the keyword “laptop model ram upgrade” – you are most likely to find a video where the whole process, including the correct removal of the cover, will be demonstrated visually. I quote the English query for the reason that it is rare in Russian to find a disassembly of a particular laptop and memory installation. Turn off the laptop, including the outlet. It is also desirable to remove the battery (if it can not be turned off without opening the laptop, then unplug the battery first after opening). Use a screwdriver to open the cover, you will see the memory modules installed in the slots. If you need to remove not a separate cover, but the entire back panel, try to find instructions on how to do it correctly since there is a risk of damaging the case. RAM RAM modules can be removed, or added new ones. When extracting, pay attention that, as a rule, memory modules are fixed from the side by latches, which need to be bent. When inserting memory, do it tightly until the latches snap into place (on most models). All this is relatively easy, you can not make a mistake here. At the end, return the lid to its place, install the battery, if necessary – connect to the mains, turn on the laptop and check whether “BIOS” and Windows see the installed RAM.